Here at Dive Bermuda Grotto Bay we have made it our mission to build upon our 30 year+ history of diving excellence to create the best dive center in Bermuda. Our attention to safety and detail means we hold our customer's satisfaction above all other factors. Professionalism and customer service are our mantra. We take the same approach to customer service, safety and professionalism as our sister dive center, Dive Bermuda at Fairmont Southampton. We aim to offer the best diving product on the island, the best boat, best equipment and the best team. Add to that world class wreck diving and pristine reefs under the most beautiful sea in the world, and you have all the ingredients for the most outstanding diving vacation for you and your family. Our fully equipped, custom built 38’ Dive boat, Bottom Time. Get your logbook out and meet us outside after your dive. 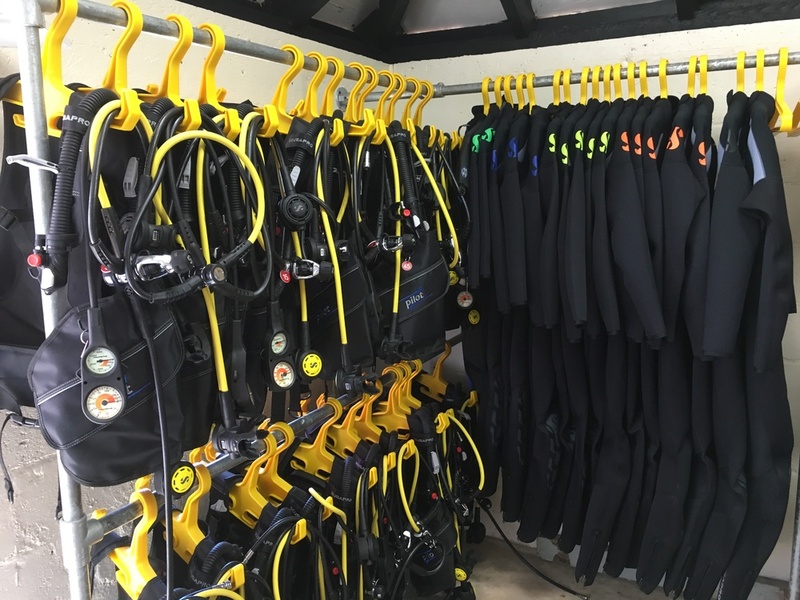 The high quality ScubaPro rental BCD, regulators and wetsuits used by Dive Bermuda at Grotto Bay. Top notch ScubaPro fins & masks for our divers. Dive Bermuda has two locations. One at Grotto Bay Resort near St. George’s and one at the Fairmont Southampton Resort. First worked at Dive Bermuda 25 years ago, still here today. Now an owner, be nice to him. Boat Captain, service technician and PADI Master Scuba Diver Trainer. Has been working for Dive Bermuda for over 20 years. Ask him anything. Now part owner of Dive Bermuda at Grotto Bay. Has been traversing Bermuda's treacherous reefs since a child. Knows his way around a boat and an engine with his eyes closed. Also a PADI Assistant Instructor and Scubapro Service Technician. Back for his second season at Dive Bermuda at Grotto Bay, Brendon is a South African Instructor. After hours you can spot him at the local watering hole where he thrives in his natural environment. Back again for a second season at Dive Bermuda at Grotto Bay. She's been working and traveling the world as a PADI Instructor for the last 3 years. Easily spotted underwater due to her bright pink fins. This summer we are happy to welcome Steff who is a Canadian who came to Bermuda via Roatan. She loves to be under the water blowing bubbles, but when she's not combing for macro life she might cooking up some curry or doing yoga. A big Bermudian welcome to this Aussie who's been traveling the world as a scuba instructor for the past 3 years. Mitch loves teaching Advanced Open Water courses and when he's not diving chances are he might be watching a moto GP race. Dive Bermuda was founded in 1981 as Nautilus Diving directly off the beach at the Fairmont Southampton Resort. Making the most of Bermuda's world class diving and the boom in recreational scuba diving, Nautilus quickly garnered a reputation as a fun, safe and pioneering dive centre. In the 1990's we changed owners and our name to the now familiar Dive Bermuda. In 1994 we joined PADI and have been a member for over 20 years now, training 1000's of divers from beginner all the way to instructor. As of 2011 we changed hands yet again with local lawyer Mark Diel taking the reigns. Mark worked at Dive Bermuda as a young man and has been associated with the company in one way or another ever since. In 2016, Dive Bermuda expanded and opened their sister dive center at Grotto Bay, which was formerly Triangle Diving. We fitted out our dive boat, dive center, and rental equipment to match the same high standards are our flagship dive center. Come dive with us and experience for yourself everything Dive Bermuda at Grotto Bay has to offer! Bottom Time off to go diving on Bermuda’s pristine reef. 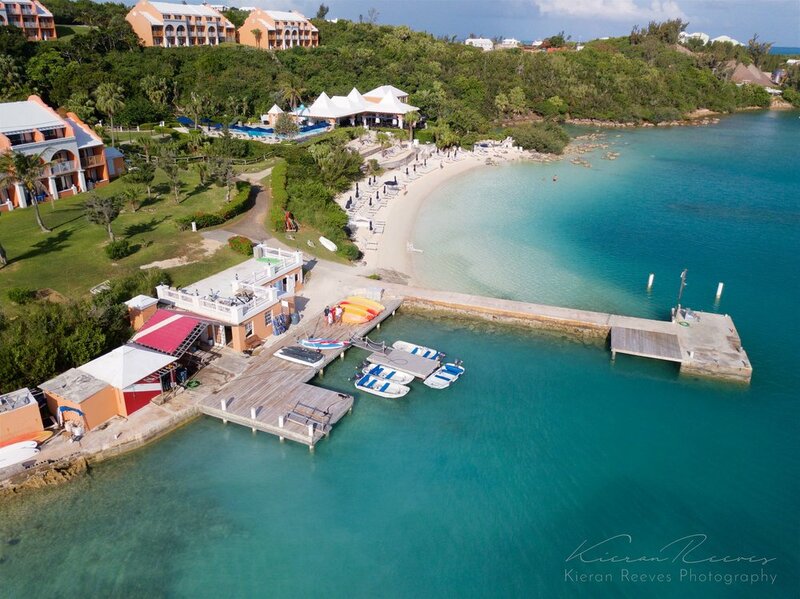 Looking out over Grotto Bay Beach Resort & our dive center directly off the dock. Grotto Bay Beach Resort is not your usual Bermuda hotel. Sitting on a lush tropical estate featuring dramatic caves and acres of woodland preserves along the water's edge in Bailey's Bay. Scattered over 21 acres and sloping down toward three private beaches are 11 colorful cottages in traditional Bermudian architecture overlooking the turquoise waters dotted with small islands. Swim on the private pink sand beach and in the freshwater pool, or languish in the outdoor Jacuzzi surrounded by gardens above the beach. Sail, snorkel, wind surf, dive ancient wrecks or explore the delicate and beautiful coral reefs. Take a boat cruise on a sunny afternoon or during a glorious sunset. Play tennis night or day, or work out in the exercise room. Grotto Bay Beach Resort is conveniently located within five minutes of two of Bermuda's finest golf courses. Check out their photo gallery to see what the Grotto Bay Beach Resort accommodations are all about.